The Multi-Sport Wheelchair from Roma Sport has been designed in association with Youth Sport Trust to encourage youth participation in various sporting activities, including basketball and tennis (not suitable for wheelchair rugby). It has been given a four-star rating by Able Magazine. The wheelchair is made in the UK and is exclusive to Youth Sport Trust. The wheelchair is available in a series of standard seat width sizes that are colour coordinated, making sizes easy to identify by schools and clubs. The flexibility in the options offers the opportunity for young people of all shapes and sizes to get involved in sport. Together with Youth Sport Direct, designing a multi-sport wheelchair began to materialise. Our objective of encouraging youth participation in various inclusive sporting activities meant that the wheelchair needed to be as lightweight as possible to facilitate the enjoyment of the sport. From individual to team sports, the multi-sport wheelchair is the perfect taster chair. The multi-sport wheelchair is designed, manufactured and tested at our facility in Bridgend, South Wales, and is exclusively available through our partners, Youth Sport Direct. There are four seat widths to choose from; all four sizes have a weight limit of 12st or 76kg. Colour coordinated sizing makes it easy for schools and clubs to identify: 12” Lime Green, 14” Red, 16” White and 18” Blue. The steel frame supports an adjustable foot rest, canvas seat sling, and backrest. 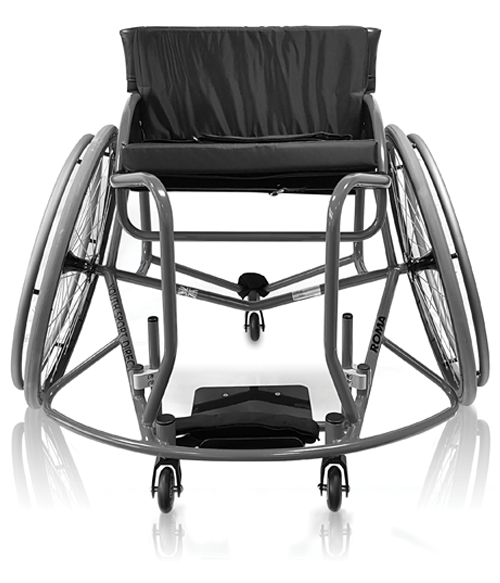 Additionally, the multi-sport wheelchair comes with a set of 24” quick-release wheels. This link will open the Youth Sports Trust website in a new window. Roma Sport respects your privacy. Your personal details will be kept confidential and will only be used to send you information on Roma Sport products and services we offer. In accordance with the Data Protection Act, we require your consent by submitting your details in order to hold your personal details within our systems. Your details will not be passed on or given to anyone by Roma Sport without your explicit permission. All employees who have access to your information or are associated with the handling of that data are legally obliged to respect your confidentiality. If you would like to see the information we hold about you or would like to be removed from any of our mailing lists, please contact our marketing department at Roma Sport York Road, Bridgend Industrial Estate, Bridgend, CF31 3TB, United Kingdom or email us at sales@romasport.co.uk.